That arresting fact is the starting point for a superb blog post by Dave Gray on the connected company, in which he explores the question of why companies appear to get less productive as they get bigger, while cities get more productive. It’s designed to be controlled by a driver or operator. It needs to be maintained, and when it breaks down, you fix it. A machine pretty much works in the same way for the life of the machine. Eventually, things change, or the machine wears out, and you need to build or buy a new machine. […] And we tend to design companies the way we design machines: We need the company to perform a certain function, so we design and build it to perform that function. Over time, things change. The company grows beyond a certain point. New systems are needed. Customers want different products and services, so we need to redesign and rebuild the machine, or buy a new one, to serve the new functions. This kind of rebuilding goes by many names, including re-organization, reengineering, right-sizing, flattening and so on. The problem with this kind of thinking is that the nature of a machine is to remain static, while the nature of a company is to grow. if we rethink the modern company, if we stop thinking of it as a machine and start thinking of it as a complex, growing system? What happens if we think of it less like a machine and more like an organism? Or even better, what if we compared the company with other large, complex human systems, like, for example, the city? Cities, of course, are not managed or controlled by anybody. Bits of them are – the provision of utilities, aspects of the transport system, the location and logistics of Tesco, Starbucks and every other chain – but in most cases that control is partial and in all cases it is separate from every other component. Looked at from the calm and rational world of organisational design, cities simply shouldn’t work. And yet they do. It is of course quite a stretch from there to suggest that companies would work better if they were more like cities. That’s for two rather different reasons. The first is definitional: if a company were that much more like a city, we probably wouldn’t call it a company at all, it would be much closer to being an emergent property of a particular set of conditions. Silicon Valley is everybody’s favourite example of that; Silicon Roundabout works on a much smaller scale, but there is considerable scepticism about the likely success of even the lightest form of directed growth, and even if it proves successful, the thing which emerges will not be a big company. The second is that cities can grow and work like cities in part because companies behave like companies. The fact that cities may work because they are chaotic at the macro level does not in itself mean that they will work if they are chaotic at the micro level. That, for Gray, indicates a series of characteristics, including loose internal connections balanced by a strong culture, characteristics which, as it happens, also seem to characterise long-lived companies. What though might any of this mean for government? If better results do come from having smaller pieces more loosely coupled, then creating that ecosystem will have to be an explicit goal for government, because it can’t so readily happen as a result of speciation (and even in the private sector, speciation, as opposed to the births and deaths of individual companies, seems to be a slow and erratic process). The big society though not, as far as I know, thought about and presented in these terms, could be seen as an attempt to move government in that direction, but does not in itself create the more connected ecosystem Gray is advocating. 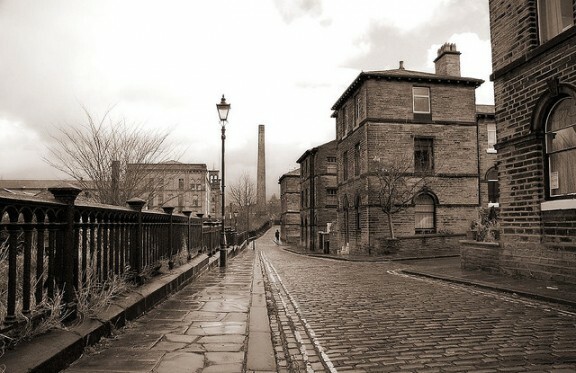 When companies make cities, the results tend to be artificial and rigid – places such as Saltaire, pictured above, or Port Sunlight have characteristics of company structures as well as city structures. They were built for a specific purpose, and struggled to find a more general one once that purpose had been lost. Whitehall doesn’t look quite like that. But if it can’t find ways of adapting and evolving, perhaps one day it will. *That apparently holds true for the S&P 500 in the US and for the FTSE-100 in the UK. In both cases, there are challenges to the methodology in the comments, so to be treated as a starting point for reflection rather than indisputable fact. †That may look like a contradiction of my own earlier argument that Whitehall departments merge and re-form with bewildering rapidity, but I am not sure that the parallel is as close as it may appear – and in any case, M&A is not the same as new company formation. Governments are fundamentally about accountability. It’s fine, and perhaps long overdue, to change the paradigm from machine to organism and, as the original post suggests, it’s an attractive shift in many ways. But governments need to be able to fulfil accountability and transparency functions that do not apply to companies or cities. Until we figure out a way to bring the accountability conversation along with the paradigmatic change discussion, it will continue to be a major roadblock. That said, the essential truth of the Dave Gray piece, and the potential of applying some of its insights to the way we govern, is very attractive. We are also going to have to evolve ways to define jobs and roles which give people some sense of clarity and position as they sit in an otherwise shifting, sometimes heaving sea of ambiguity, complex and evolving relationships and highly adaptable roles and functions. Interesting thought, I agree in part, but not completely. Yes, one of the distinctive things about governments – or rather about democratic governments – is accountability, but below the top level, it’s less clear that that is what they are fundamentally about. The point of a public health service is to provide health care, the point of a rubbish collection service is to collect rubbish, the point of schools is to educate. You can argue, and I would join you in arguing, that all of those things are better done transparently and accountably, but for government-as-service-provider, it’s an interesting question about how far that is a means to an end and how far it is the end in its own right. That said, I do agree that the requirement for accountability is a critical and distinctive additional dimension for public sector organisations, and that that affects how we think about their structures. One of the questions in my mind as I was writing the post, but which I didn’t pursue for fear of making it even more discursive, was whether that pushed the argument one way or the other. One of the features of machine-metaphor organisations is that there is a very clear line of formal accountability to political representatives; one of the features of more organic organisational structures might be that formal links are less strong or less clear, but accountability in a broader sense is strengthened (or, of course, that it is lost altogether). Or, to put it another way, what, if anything do we lose or have to trade off if we want to design primarily for accountability?